WHEN the Gillard Government’s climate change adviser, Ross Garnaut, isn’t busy having dinners with independents Tony Windsor and Rob Oakeshott, he has been releasing umpteen papers on how to remake our economy. His work has been damned by the energy industry as “undergraduate”, “simplistic”, “superficial” and “full of high-level principles that assume away” real-world problems. The criticism doesn’t seem to have dimmed the professor’s enthusiasm for a carbon tax, even as polling this week shows public appetite ebbing with each passing day, with just 34 per cent of people declaring they support the tax. But this week Garnaut slapped back at the power generators, claiming electricity price hikes higher than any on the planet are all their fault. He did not mention the role of rapacious state governments who have clawed out dividends for years and demanded expensive and inefficient green alternative energy sources. And he ruled out compensation for energy companies who make sure our lights switch on and are complaining they will go belly-up under a carbon tax. JULIA Gillard’s chief climate change adviser has been lashed by the $120 billion energy sector, which says his latest advice is a risk to investment and could lead to a multi-billion-dollar lawsuit against the government if followed. As the opposition seized on Ross Garnaut’s latest report as evidence that Labor’s carbon policy would lead to brownouts and insufficient electricity production, the sector slammed it as “naive”, “commercially unsophisticated” and “undergraduate”. The nation’s biggest private power producer, International Power Australia, urged the government to recognise the “shortcomings and dangers” of Professor Garnaut’s update on how the electricity sector should be treated under a carbon price. That’s going to go down well in NSW… It is truly frightening that someone who is so clearly disconnected from economic reality is in charge of advising the Australian government on the effects of carbon pricing. Ross (Guano) Garnaut is nothing but a joke. This guy is a true academic. He’s never had a ‘real’ job in his life. He’s never had to struggle to make a payment on his electricity bill or mortgage. He lives in the rarefied air of economic academia. And now the Labor/Green alliance has chosen him, an economist, alongside Tim (Foolery) Flannery, a paleontologist, another academic, to lecture the Australian people the need for a carbon dioxide tax. Just how Guano and Foolery are supposed to connect with Joe Average on the street is beyond me. Neither have any concept of common sense and would connect better with ‘basket weavers’ from Balmain and doctors wives from Vaucluse, than Joe Average having a beer at his local RSL. The plight of struggling families and pensioners would be an anathema to these clowns, even before this governments carbon dioxide tax impost was added to their weekly expenses. Does anyone remember the UK’s “The Stern Review”? Garnaut’s report is seriously flawed and deficient too… more or less on the same lines as “The Stern Review”… i.e. placing reliance on poor pseudo science of the IPCC… and flawed economic aspects. I mean economics is such a success if engineering was so succcessful you would not be game to go out your front door in the morning.Glorified tea leaf readers that is all they are. Glorified tea leaf readers that is all they are. Yes but rukidding, tea leaf reading is an essential component of the warmist resume. I mean just look how talented Tim – well all be rooned – Flannery Foolery is at green crystal ball gazing. Yes indeed, his are the kind of predictions you can set a two bob watch by. It appears that both “august” entities are still full of the weed they smoked as students. Garnaut especially is a sickening example of pseudo-scientist. No doubt were he around in Salem he would be in forefront of the mob burning so called witches on the stake. Having missed on that fun and games instead he continues to be faithful Labor servant from Whitlam to Gillard and now graduating to Brown’s behind from where he proceeds to plan screwing up Australia. What an effluential air head…. These are just the right people to advise Juliar, Swain, Cowbert and Brown Bob as they are all inahbiting the same intelectual cesspit. Put a problem to 10 economists in a room and they will come up with 100 solutions… that’s how ‘good’ economists are!!!!!! So why would a government rely on one economist who is seen to be heavily biased toward the IPCC’s mantra? Garnaut may well enjoy his ‘ten pieces of silver’ for delivering his sub-standard, biased and flawed report to a desperate government that will cling to anything that gives its carbon tax some support. 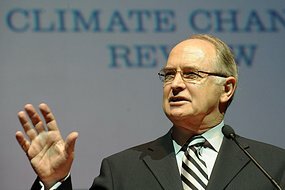 But as the truth of the real-world climate data is now being revealed, and the IPCC’s flawed and defective climate computer model-based predictions are now being exposed, Garnaut’s report will stand as testimony of his incompetence and blind faith in the IPCC’s mantra … as well as his fanatical involvement in promoting the great global warming swindle!